Ethylbenzene (EB) is a highly flammable, colorless liquid that has a sweet aroma similar to that of gasoline. Nearly all ethylbenzene produced in the world is used in the manufacture of styrene; therefore, ethylbenzene demand is determined primarily by styrene production. Styrene is used mostly in polymer production for polystyrene, acrylonitrilebutadiene-styrene (ABS) and styrene-acrylonitrile (SAN) resins, styrene-butadiene elastomers and latexes, and unsaturated polyester resins. The major styrene industry markets include packaging, electrical/electronic/appliances, construction, and consumer products. Consumption of ethylbenzene for uses other than the production of styrene is estimated to be around 2%. These applications include use as a solvent and, on occasion, the production of diethylbenzene, acetophenone, and ethyl anthraquinone. In 2017, over 98% of ethylbenzene was consumed in the production of styrene. After a significant amount of restructuring and rationalization, the global styrene industry has continued the long, slow process of recovery from the previous decade’s recession. Despite the improved performance and improving outlook for the global styrenics industry, low underlying demand remains a fundamental weakness. Demand growth rates remain stubbornly below GDP growth on a global basis and this is unlikely to change. Polystyrene (PS) is styrene’s largest demand sector, accounting for over 35% of global styrene demand. The other main end uses for styrene and their shares in 2017 include expandable polystyrene (21%), ABS resins (17%), unsaturated polyester resins (6%), SB latex (5%), and SB rubber (4%). Polystyrene is broken into two types, general-purpose polystyrene (GPPS) and high-impact polystyrene (HIPS). Generalpurpose polystyrene is a clear crystal polymer that can have different properties, such as melt flow index and chemical resistance, among others. High-impact polystyrene (HIPS) contains about 7% polybutadiene, which is grafted onto the styrene polymer. For more specific details, refer to the CEH Styrene report. Northeast Asia is the dominant player in the ethylbenzene industry, accounting for 46% and 47% of global capacity and consumption, respectively. China is the main driver, accounting for 56% of regional capacity and 49% of regional demand as of 2017. China will also be the fastest-growing country in the forecast for ethylbenzene, with an expected 8.6% average annual increase between 2017 and 2022. The CIS and Baltic States will be a very distant second, with an expected average annual growth rate of about 2% over the next five years. 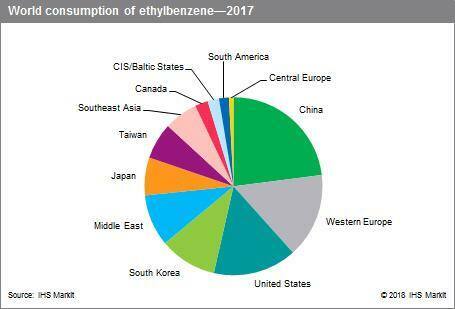 There were a total of 92 ethylbenzene producers across the globe in 2017. The top 15 producers represented over 44% of the total capacity in 2017. INEOS Styrolution is the largest producer, with capacity located in North America and Western Europe and about a 7% capacity share in 2017. LyondellBasell and Formosa Chemicals & Fibre Corp. (FCFC) are the next largest, each accounting for about a 4% capacity share. Global ethylbenzene and styrene demand are both projected to grow at about 2% per year during the forecast period.